Utagawa Kuniyoshi (1797-1861) Skillfully Tempered Sharp Blades: Sano Jirozaemon, 1847/8. Oban. This is such a fine series, dedicated not to the men who wielded them but to the blades themselves, to swords of legend or ill-repute. Given the subject matter, the prints from this series are all gruesome and drenched with blood and tragedy. Kuniyoshi here delights in the stickiness of the stuff - its tendency to leave hand prints and foot prints, to spray, splatter and to drip. The print shows the act of the crime, and the aftermath; like a CSI Crime scene set, the print displays all of the forensic clues to enable a successful prosecution. The sword-smith (these men are still revered in Japan to this day) commemorated here is Rai Kuniyuki, also known as “Two Character Kunyuki” from the Rai School in Kyoto of the 14th century. The crime itself - a true story - describes a farmer, Sano Jirozaemon who is disfigured with smallpox. He is bequeathed a magic sword that will bring him good luck as long as it remains sheathed. As a result he prospers and becomes a successful businessman, falling in love with a prostitute, Yatsuhashi who returns his affections but leaves him for a former lover. Enraged, he pursues her and kills her, he is in turn pursued by the authorities but manages to also kill his rival before surrendering. 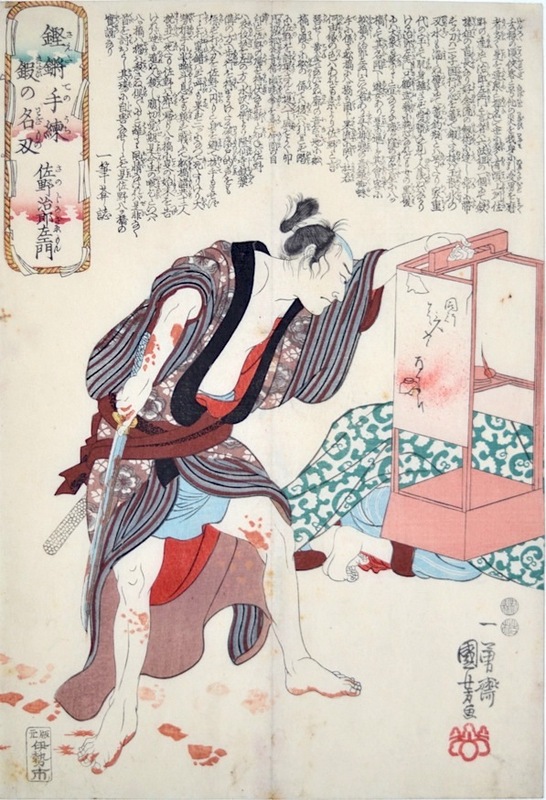 Kuniyoshi shows Jirozaemon ready to strike the final blow and Yatsuhashi crawling away behind the raised and bloodstained lamp. This is a well regarded and quite rare series. It was a huge influence on Yoshitoshi who is widely credited with the invention of these gruesome and blood filled scenes. The colour and impression is very good as is the condition, except for a vertical centre crease. The print is the same copy as that used on the reference site Kuniyoshi Project. Please enquire about others from this series which are also available. A copy of this print is in the British Museum, London.